The IBM 3489 InfoWindow II Modular Display Station is an AS/400* twinaxial-attach, modular design, display terminal supporting OS/400* advanced 5250 functions of: 5250 Image/Fax: The 3489 can display and locally print single-page monochrome image or facsimile. The 3489 supports popular image formats (IOCA, PCX, TIFF) and image viewing manipulations (scale, rotate, reverse image, scroll). The 3489 is designed for AS/400 applications that support image or facsimile, for example, IBM's Facsimile Support 400*. 5250 Shared-Addressing: The 3489 can have up to four display sessions share a single address. 5250 Video Delivery: An AS/400 application can control audio and full-motion color video of Tecmar's PC/TV**. The modular design, logic unit and the attachment of various IBM monitors, provides customers: a wide range of price points, the ability to maintain their monitor investment with PC environments, and the ability to place the modular logic unit on the floor or desktop, as well as mount on the wall for optimized use of space. The 3489 supports attachment of Tecmar's PC/TV with full tuner controls of audio and full-motion color analog video, in a fully scalable pop-up window. The 3489, with attachment of selected IBM monitors, meets recognized national and international standards, including guidelines on ergonomics, emissions, safety and power consumption. This includes: International Standard ISO 9241-Part 3 on ergonomics and MPR-II guideline on emissions. The 3489 also supports the following previously announced InfoWindow functions: four-display with printer session, five screen formats, split screen, enhanced user interface, mouse/light pen support, power management, printer definition table download, and calculator. Supports OS/400 advanced 5250 functions: Image/Fax, Shared-Addressing and Video Delivery. Image/Fax: The 3489 can display and locally print single-page monochrome image or facsimile. Users can simultaneously view an image within a 5250 text session. Users can also print the displayed image on a printer that is attached to the 3489. The 3489 supports popular image formats and image viewing manipulations. Shared-Addressing: The 3489 can have up to four display sessions can share a single address which increases the maximum possible display sessions per controller. Video Delivery: An AS/400 application can control the audio and full-motion color analog video of Tecmar's PC/TV. Provides modular design, like the InfoWindow II 3488, that allows the user to select the monitor, maintain monitor investment with PC environments, and provides for wall, floor or desktop placement. Supports attachment of Tecmar's PC/TV with full tuner controls of audio and full-motion color analog video, in a fully scalable pop-up window. Meets recognized national and international standards, and guideline on ergonomics, emissions, safety and power consumption. This includes: International Standard ISO 9241 Part 3 on ergonomics and MPR-II guideline on emissions. Supports previously announced InfoWindow functions, which includes: four-display with printer session, five screen formats, split screen, enhanced user interface, mouse/light pen support, power management, printer definition table download, and calculator. 5250 Image/Fax allows the 3489 to display and locally print a single-page monochrome image or facsimile. The 3489 supports popular image formats (IOCA, PCX, TIFF) and image viewing manipulations (scale, rotate, reverse image, scroll). The image, that is displayed on the 3489, can be locally printed on a printer that is attached to the 3489's parallel printer port. Printers, attached to the 3489, that support image print include: IBM's LaserPrinter (4019, 4029, 4039) and IBM's ExecJet II (4076). The 3489 offers customers a simple, lower-cost method to view facsimile or image. The 3489 can have four display sessions share a single address. Shared Addressing increases the total number of possible display sessions per twinaxial workstation controller port from 7 to 28, which increases the total number of possible display sessions that can be supported by the workstation controller. #6050 local workstation controller: The total possible display sessions increases from 40 to 120 display sessions. 5494 Remote Control Unit: The total possible display sessions increases from 56 to 120 display sessions. These increases allow customers to take advantage of the multi-session of the two, three, and four, display session capability without requiring the need and associated cost for additional workstation controllers and cabling to support the additional display sessions. For end-users that require two, three or four display sessions, Shared Addressing reduces the cost of installing additional workstation controllers and cabling. For end-users that today require one display session, in the future, they can have two, three or four display sessions without any increase in cost. The 3489 supports attachment of Tecmar's PC/TV which provides end users the capability to display and control audio as well as full-motion color analog video using an antenna, cable, or external video source, in a movable, sizable pop-up window. Control of audio and full-motion color analog video is possible through local 3489 keyboard control and/or through an AS/400 application with the capability of OS/400 5250 Video Delivery. Potential applications include: education/training, closed circuit monitoring for medical, banking, hotel, warehouse and distribution operations. PC/TV attachment reduces the hardware requirements for customers that use an AS/400 application and have the capability of viewing full-motion color analog video. With 3489 setup and attachment of selected IBM monitors, the 3489 meets recognized national and international standards and guidelines on ergonomics, emissions, safety and power consumption. With 3489 setup and attachment of selected IBM monitors, the 3489 meets ISO 9241 on ergonomics. This standard specifies front-of-screen characteristics, such as: flicker, jitter, brightness, character height, character format, character spacing, and luminance balance. Compliance with ISO 9241 provides for improved operator comfort and performance. The 3489 also supports advanced power management techniques which reduces IBM monitor power consumption, thus reducing energy costs, and prolonging the life of the IBM monitor when the 3489 is left unattended for long periods of time. The 3489 is a modular design consisting of: logic unit, keyboard and support for attachment of an IBM monitor. Install the modular logic unit on the desk, floor or mount on the wall for optimized use of space. Selected models of the 3489 include popular IBM monitors. These packaged offerings allow customers to order an entire display workstation; modular logic unit, keyboard and IBM monitor. This reduces the administration time for ordering. The one-time delivery of the modular logic unit and IBM monitor also allows quick 3489 installation and setup. Four Display and One Printer Sessions (DDDD+P): Users can have up to four display sessions and one printer session. Display sessions can be displayed by toggling between the sessions. When combined with split screen, users can display data from two display sessions at the same time. Five Screen formats: Users can configure for 24, 32, 43, or 49 rows by 80 columns, as well as 27 rows by 132 columns. Variable horizontal and vertical split screen: Users can display two partially or full sessions in a top-bottom or side-by-side format. Using the mouse, light pen or keyboard users can move the split line up-down or left-right. Enhanced User Interface: The Enhanced User Interface exploits the user interface of AS/400 applications include items like: menu bars/pull-downs, pop-up windows, selection fields, selection lists, and pushbuttons using special symbols. The Enhanced User Interface is designed for use with the mouse and/or light pen for point-and-click operations. Mouse and/or light pen: Mouse and/or light pen attachment allows for point-and-click operation of: setup, local functions, copy/paste, enhanced user interface or hotspots. Calculator: The calculator allows users to import data from an AS/400 application, perform a calculation, export data back to the AS/400 application for increased accuracy. Record/Play: Users can store up to 6,000 keystrokes for later playback. Printer Definition Table (PDT) Download: The 3489 can receive a downloaded printer definition table from an AS/400. A printer definition table provides printer support flexibility. The 3489 is a full-function InfoWindow II Modular Display with added capabilities of: Image/Fax Viewing, Shared Addressing, and PC/TV attachment. The 3489 includes all of the functions in the InfoWindow II 3488 Modular Display Station Model V.
The 3489 is the first AS/400 Display Terminal with image capabilities. The 3489 is designed for customers that need to view facsimile or image. The 3489 is best suited for customers that have 'casual' image requirements, and is not designed for customers that have 'production/operational' image requirements. 'Casual' image is defined as: the need to view single-page image every few minutes. 'Production/operational' image is defined as: that need to view multiple-page documents every few seconds. The 3489 can receive and display single-page image in a few seconds. Ease of installation; no communication adapters or software to install, as well as simple user setup menus. Managed work environment; only approved use of authorized programs. The following table lists the comparison of major functions of the InfoWindow II 3486/3487/3488/3489. For detailed information on the 3486/3487/3488, refer to the 3486/3487/3488 announcements. Some of the listed functions are dependent on OS/400, AS/400 application and workstation controller, refer to 'Software Requirements' for details. The 3489 and specify features are customer setup (CSU). CSU information is described in the 'IBM InfoWindow II 3489 Users Guide'. The 3489 Users Guide is available in English or National Languages. The 3489 supports US English. Note: The AS/400 application may not support national languages, refer to the appropriate AS/400 application for information on national language support. For AS/400 national language support, refer to the appropriate AS/400 announcements or manuals. The 3489 screen formats (Modes 2,3,4,5 and 6) can be combined with OS/400 screen formats (Modes 2 and 5) when the 3489 is configured for two or more display session and split screen allowing users to view two display session simultaneously in split screen mode. The following table lists the 3489 IBM monitor support, and 3489 Screen Resolution/Font Matrix. in every geography and monitors may be withdrawn from marketing. Viewable Image Size: The monitor's viewable image size (inches). Notes: Any notes that may apply for a specific monitor. M2 (Mode 2): Supports 24 rows by 80 columns (Mode 2) Screen format. An asterisk indicates ISO 9241 Part 3 compliant. M3 (Mode 3): Supports 32 rows by 80 columns (Mode 3) Screen format. M4 (Mode 4): Supports 43 rows by 80 columns (Mode 4) Screen format. M5 (Mode 5): Supports 27 rows by 132 columns (Mode 5) Screen format. RR (Refresh Rate):  The monitor's operating refresh rate. - M2, M3, M4 is supported, M5 or M6 is not supported. - Power Management is not supported. - Monitors operate in 60 Hz refresh rate. - Monitors operate in Group B screen resolution. may require adjustments when changing between M2, M3 and M4. selected by using 3489 Resolution Override Option. EPA Energy Star Levels. Functions must be manually selected. Font Type is selected using 3489 Resolution Override Option. - Viewable Area includes divider line and Operator Information Area. - Font Matrix is based on upper case characters. Screen Format/Screen Resolution Characteristics are a local function of the 3489. If the 3489 is configured for a Printer-Only, the IBM monitor does not need to be attached. Multiple display sessions allow users to have multiple sign-ons and execute multiple AS/400 applications simultaneously. Note: For increased user productivity, multiple sessions can be used with the Split Screen function, which allows users to view two display sessions simultaneously. Multiple Display-Printer Sessions is a local function of the 3489. Split Screen allows users to view two display sessions in a top-bottom (horizontal split screen) or a side-by-side (vertical split screen) combination. The two display sessions are separated by a Split Screen Separator Line. The Separator Line can be moved by the keyboard, mouse or light pen. Split-Screen is a local function of the 3489. CCITT Group 3 Fax one-dimensional modified Huffman run length encoding. Scroll Bar Local Scrolling: The mouse can be used on the local scroll bars (slider, arrows) to move the image up/down or left/right. When using the mouse on the scroll bar slider, the image moves at the same rate as the mouse moves. Direct Image Local Scrolling: The mouse can be used directly on the image within the Image/Fax Viewport to move the image in any direction. The image moves at the same rate and direction as the mouse moves. Keyboard Local Scrolling: The 3489 has local keys defined to scroll image up/down or left/right. AS/400 Application Controlled Scrolling: An AS/400 application can define scroll bars for image scrolling. Reverse Image: The 3489 supports reverse image. This causes the image foreground and background colors to reverse, for example black-on-white to white-on-black. Reverse Image is user initiated and AS/400 application controlled. Rotation: The 3489 supports 0, 90, 180, and 270 degrees of clockwise rotation. Rotation is user initiated and AS/400 application controlled. Scaling: The 3489 supports a scaling range of 3% to 400%. Scaling can be local or AS/400 application controlled. Local Control Scale Up: The mouse is used to size a magnify area within the Image/Fax Viewport. The image, within the magnify area, is scaled up to the size of the Image/Fax Viewport. Specific Percentage Scaling: The image is displayed at a percentage value of 3% to 400%. No Scroll Bar Scaling: The image is displayed at the largest scaling percentage without requiring local scroll bars (horizontal and vertical). Fill Scaling: The image is displayed at the largest scaling percentage value that would not require horizontal local scroll bars. Increment/Decrement Scaling: The image is scaled up 133% (Increment) or scaled down 75% (Decrement). Any session can display an Image/Fax Viewport; however, the 3489 can have only one active Image/Fax Viewport. The resolution of the image/fax is dependent on the IBM monitor that is attached, and the configured 3489 screen format. Refer to 'Screen Formats/Screen Resolution Characteristics'. 5250 display session text cannot overlay Image/Fax data in the Image/Fax Viewport. The 3489 can receive up tp 128k bytes (compressed or uncompressed) of image data. Image/Fax is dependent on OS/400, AS/400 application, and workstation controller. Refer to 'Software Requirements' for details. 5250 Video Delivery allows AS/400 application control of PC/TV. PC/TV attachment allows end users to display and control audio and full-motion color analog video using antenna, cable, or external video source in a movable, sizable pop-up window. An external video source may include: video cassette recorder, videodisc player or a video camera. Control of audio and full-motion color analog video is possible local, through the 3489 keyboard, or via an AS/400 application using 5250 Video Delivery. PC/TV is a separate modular unit which contains a cable ready TV tuner and internal speaker. Audio and full-motion color analog video PC/TV controls include: channel selection, volume, mute, brightness, contrast and color. Contact Tecmar (216-349-0600 USA) for more information regarding PC/TV. 5250 Video Delivery is dependent on OS/400, AS/400 application, and workstation controller. Refer to 'Software Requirements' for details. The Enhanced User Interface improves the user interface of AS/400 applications that display items like: menu bars/pull-downs, pop-up windows, selection fields, selection lists, pushbuttons, using the following special symbols: scroll bars, check boxes, radio buttons and window frames. Users can use the mouse or light pen for menu bar selections, pushbutton and scroll bar operations. Scroll bar operations include scrolling the image in the Image/Fax Viewport. Enhanced User Interface is dependent on OS/400, AS/400 application and workstation controller. Refer to 'Software Requirements' for details. Shared Addressing allows up to four 3489 display sessions to share a single address. Shared Addressing is dependent on OS/400 and workstation controller. Refer to 'Software Requirements' for details. Extended Foreground Colors increases the number of AS/400 application displayable foreground colors from 7 to 14. Extended Foreground Color is dependent on OS/400, AS/400 application and workstation controller. Refer to 'Software Requirements' for details. A mouse can be attached to enhance the keyboard operation of advanced OS/400 5250 and 3489 local functions. Enhanced User Interface (scroll bars, check boxes, pushbuttons, selection lists). Sizing the magnify area within the Image/Fax Viewport. Locally scrolling an image in the Image/Fax Viewport. Moving the split screen separator line when in split screen mode. Scrolling the display session window. Selecting setup parameters in the setup menus. Sizing the trim frame for local print and calculator box summation. Enhanced User Interface, Hot Spots, Copy/Paste is dependent on OS/400, AS/400 application and workstation controller. Refer to 'Software Requirements' for details. The 3489 supports attachment of FTG Data Systems Light Pen, Model PXL-780. The light pen connects into the mouse port. The mouse may also be attached to the light pen connector. The light pen provides mouse emulation of left button, double click and right button for use with advanced OS/400 5250 and 3489 local functions as described in 'Mouse Support' section. Contact FTG Data Systems (714-995-3900 USA) for more information regarding light pen. The 3489 supports attachment of the IBM 7695 Model 255 Barcode/Magnetic Badge Slot Reader. The 7695 connects to the 3489 via the keyboard port of the 3489. The 3489 keyboard is then connected to the 7695. The 3489 perceives the 7695 input as keyboard input. Calculator allows users to perform calculations locally. The Calculator provides storing and retrieving of numeric data, and well as frequently used mathematical expressions. Data can be imported from the AS/400 application, perform calculation, then exported back to the AS/400 application. The calculator also supports box-summation capability. The calculator is a local function of the 3489, but calculator export feature is dependent on OS/400 and workstation controller. Refer to 'Software Requirements' for details. The Record/Play function allows users to store, retrieve, and display data with a single key entry. The Record/Play function eliminate repetitive operations. The Record/Play function allows storage of 6,000 keystrokes. The keystrokes are assigned to the 24 function keys. The recorded keystrokes are saved in 3489 memory, even during power-off. The Record/Play function offers three levels of security: No protection, Non-display field protection and Record/Play function disabled. Record/Play is a local function of the 3489. Users can configure each display sessions background color. Background colors provide for quick display session identification when multiple display sessions are configured. Background Colors is a local function of the 3489. A 262,000 color palette is available for users to change various items that are displayed on the 3489. Items include: foreground colors, display session background colors, image foreground and background, rule line cursor, mouse pointer, trim print border, and split screen separator line. Color Palette is a local function of the 3489. The 3489 supports an IBM or customer installable expansion cartridge. This expansion cartridge modifies the 3489 operation, providing investment protection as customer requirements evolve. This expansion cartridge may be used to add possible future IBM enhancements, or IBM may offer a cartridge to meet unique customers requirements. The 3489 logic unit will automatically dim the monitor, except for the status line, when the keyboard has not been used for a predetermined amount of time. Auto Dim is a local function of the 3489. The 3489 logic unit supports Video Electronics Standards Association Display Power Management Signaling Proposal (VESA DPMS) which uses the horizontal and vertical sync lines to control the power circuitry (reduces monitor power consumption) in the monitor when the 3489 does not receive any data from the host system for long periods of time. The 3489 supports Suspend (horizontal sync is active, vertical sync is in-active) State, Off (horizontal sync is in-active, vertical sync is in-active) State. Power Saver is a separate feature to the Auto Dim feature. Auto Dim blanks the monitor but does not reduce monitor power consumption. Power Saver occurs after Auto Dim (if selected in 3489 setup). Suspend State is entered (if selected in 3489 setup) after Auto Dim. The time for Suspend State is 5-60 minutes, in 5 minute increments, which is specified in 3489 setup. Off State is entered 60 minutes after Suspend State. 14V, 15V, and 17V are designed to meet U.S Environmental Protection Agency "Energy Star" program. 14P, 15P, and 17P are designed to meet U.S Environmental Protection Agency "Energy Star" program and Swedish NUTEK standards. Note: The U.S. Environmental Protection Agency, as a matter of policy does not endorse any particular company or product. For specific reduced monitor consumption values, refer to the appropriate IBM monitor information. Advanced Power Management is a local function of the 3489. The 3489 has a parallel printer port which can be used for local printing or, when the 3489 is configured for a printer session, for system (AS/400 host) printing. Local Printing: The 3489 allows the user to locally print what is displayed on the screen. The user can print either the alphanumeric text or the image. System Printing: The 3489 emulates IBM 5256, IBM 4214 and IBM 3812-SCS printers. 3812-SCS printer emulation includes support for Computer-Output Reduction (COR) function. COR, along with Automatic Page Orientation, provides automatic adjustment of print output on selected page printers. Automatic adjustment includes: page orientation (rotation), font selection, lines per inch, and top/left margins. COR allows printer output to be modified automatically without changing paper settings. The following table lists the supported printers, system printer emulations (5256, 4214, 3812-SCS), and local image print. The printer cable should be ordered, part number 1525612. Printer Table Definition (PDT) Download allows the user to customize their printer environment; to support printers not listed in 'Printer Support' or to enable additional functions (color support, font mapping, EBCDIC to ASCII translation, or multiple bin support) on printers by downloading a PDT from the AS/400. Printer Table Definition Download is dependent on OS/400 and workstation controllers. Refer to 'Software Requirements' for details. Low-profile keyboard providing two angles of inclination (5 or 12 degrees). Typeahead provides continuous typing of up to 32 characters while the keyboard is locked. An IBM KeyGuard is available for typewriter and IBM Enhanced keyboards for persons that may be physically impaired. Most keys are recappable allowing the user to install custom keycaps (blank, clear with inserts) for unique application requirements. Both audible and tactile feedback indicates the acceptance of a key entry without the need to view the display. This positive feedback is designed to reduce typing errors, thereby increasing productivity and accuracy. A 122-key Quiet Typewriter keyboard is available for noise sensitive environments. Note: The 122-key Quiet Typewriter keyboard provides tactile feedback only and is not recappable. A 101-key Quiet Touch keyboard is available for environments that require a space-saving keyboard, such as; banking or point-of-sale. The Quiet Touch has two components, an 84-key PS/2* style keyboard with PS/2 nomenclature and a detachable 17-key numeric keypad. Note: OS/400 support keyboard customization function which allows modifications to the keyboard operation. 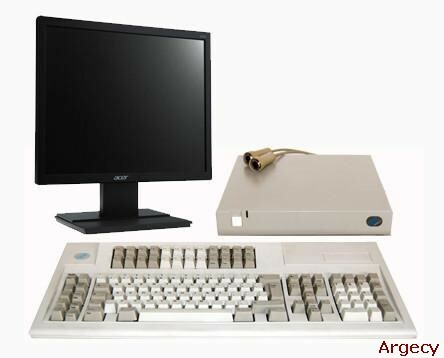 Keyboard customization is dependent on OS/400 and workstation controllers, refer to 'Software Requirements' for details. The 3489 requires single phase, 50 or 60 Hz electrical power. The resolution of the image/fax is dependent on the IBM monitor that is attached, and the configured 3489 screen format. Refer to 'Screen Formats/Screen Resolution Characteristics' in 'Technical Description'. screen size of 13.06 inches (332 mm) when measured diagonally. screen size of 13.7 inches (348 mm) when measured diagonally. screen size of 15.8 inches (402 mm) when measured diagonally. screen size of 13.03 inches (332 mm) when measured diagonally. screen size of 15.39 inches (391 mm) when measured diagonally. The 3489 attaches directly to an AS/400 via a local workstation controller, or remotely to an AS/400 via a 5394 or 5494 Remote Control Unit. Attachment is by the same type of cable as used to attach an IBM 3486, 3487, 3488, 3476, 3477, or other IBM 5250 Information Display System device. An Auto Termination Unit is provided with each 3489. Some 3489 functions are dependent on the workstation controller and 5494 Remote Control Unit. Refer to 'Software Requirements' for details. When using the 3489 with an AS/400 image or facsimile environment, determine what hardware is required by the image or facsimile application. For example, IBM Facsimile Support/400 would require either a PS/2 Fax Controller or AS/400 Integrated Fax Adapter. The 3489 attaches directly to an AS/400 via a local workstation controller, or remotely to an AS/400 via a 5394 or 5494 Remote Control Unit. Cabling used may include the IBM Cabling System, twinaxial cable, type 3 telephone twisted-pair (TTP), or equivalent. When attached via the TTP, there can only be one display per port unless a 5299 Model 3 Terminal Multiconnector is used. If a 5299 is not used, a twinax to twisted-pair adapter (TTPA) at each end of the twisted-pair cable is required. screen size of 8.02 inches (204 mm) when measured diagonally. screen size of 13.06 inches (331 mm) when measured diagonally. screen size of 10.3 inches (262 mm) when measured diagonally. The following table lists OS/400 advanced 5250 functions supported by OS/400 and workstation controllers. Note: These OS/400 advanced 5250 functions are not supported by the 5394 Remote Control Unit. as described above. 3488 requires an AS/400 PTF. controllers: #2661, #6050, #9146, #9148.
local twinaxial workstation controllers: #2638, #6040, #6140. The following publication is shipped with the product. Additional copies are available immediately.